Entertainment Earth dropped us a line and gave us an exclusive first look at an upcoming convention exclusive due out this summer! They will be selling a limited run of the Game of Thrones Dragon Egg Prop Replica Set in Wooden Box by Artisan Designs. This new limited run will feature a gold satin liner and a gold Targaryen three-headed dragon sigil on the box. The set is limited to 500, and will be hand numbered on the bottom. This item will first be sold at San Diego Comic-Con 2014 at the Entertainment Earth Booth #2343. If supplies remain after the show, retail orders will be filled and shipped then, during the first week of August, 2014. You can check their product page for it here. The season finale of Game of Thrones is this weekend, but you’ll have to wait until this summer to grab this limited edition set! Check out the official details below, then head over to Entertainment Earth to grab your pre-order in case there are any left! You may not be the Mother of Dragons, but you can feel like her with this Game of Thrones Dragon Egg Prop Replica Set in Gold Wooden Box. 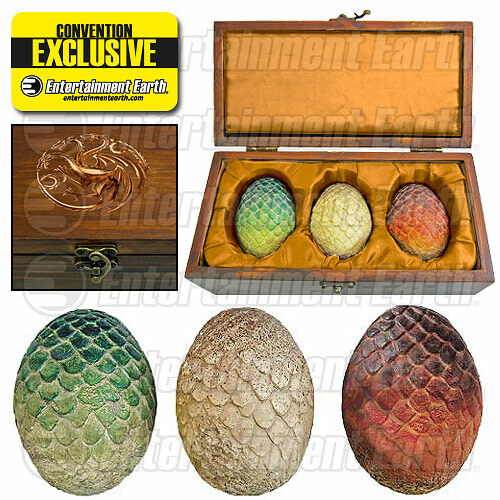 The unique set consists of 3 small resin replicas of the eggs used on the actual Game of Thrones set. The exquisitely detailed Rhaegal, Viserion, and Drogon eggs fit in their handcrafted satin-lined wooden case with metal latch. Each egg measures 3-inches tall x 2-inches in diameter, while the box measures 9 3/4-inches wide x 5-inches deep x 4-inches long. Together, they weigh over 2 pounds! This special limited edition features a golden Targaryen sigil on the top of the case, gold satin lining in the wooden case to cradle the eggs, and hand numbering on the bottom of the case.